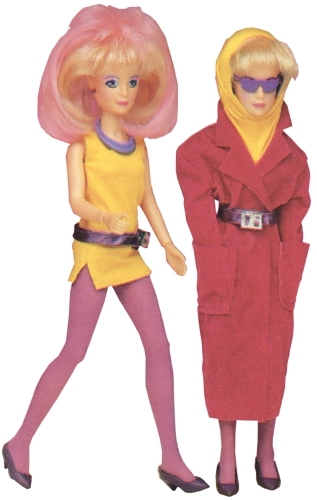 Hasbro package contents listing Includes: Pink maxi coat, yellow mini dress, cloche, belt, tights, collar necklace, pumps and sunglasses! One of the easier Jem fashions to find. Skip here for a listing of other depictions of City Lights (cartoon, prototypes, catalogues, etc). 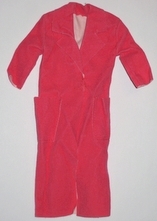 Pink maxi coat: Dark orange-pink velveteen trench coat, two large pockets, velcro closure in front. 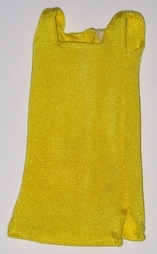 yellow mini dress: Bright yellow spandex mini tank dress; slit up the sides. 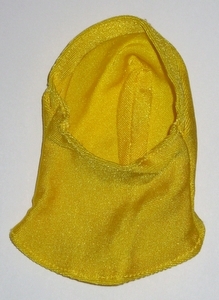 cloche: Bright yellow spandex, matches dress. 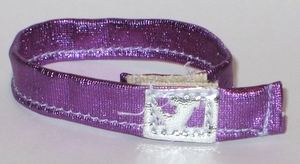 belt: Purple lamé; long enough to fit over the raincoat. Velcro closure. Sewn on silver lamé "J" buckle. tights: purple matte tights, elasticized waist. 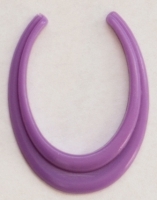 collar necklace: purple plastic, matches shoes. pumps: royal purple straight edged pumps. the same shade as those from We're Off And Running. There is most likely a thin-sided version as well as the thick sided version shown left. 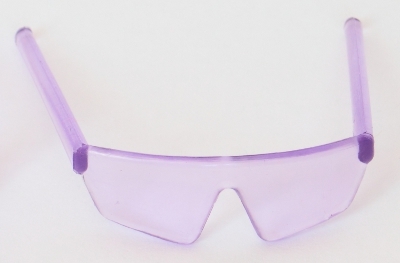 sunglasses: purple with triangular shaped nose. See a photo beside the glasses that came with Rappin'. There is also a wider nose-notch version of these glasses (note they are not the same style as the Rappin' glasses) which I believe would have come from an H44 box. Packaging Variants: A listing of the packaging that City Lights can be found in, that I know of, so far! Bold listings are those I have used to create this ID page. Anything in Italics I haven't actually seen but have good reason to believe exists. If you have any photos or information/corrections to share, I'd love to hear about it! At least one, and possibly all three came in both H22 and H44 marked boxes. Hasbro catalogues # City Lights and the other Flip Sides in the 1986 US Hasbro Toy Fair Catalogue (see left) The glasses look opaque, other than that, looks like the produced fashion. # City Lights in the 1986 German Leaflet (same photo appears in the 1986 Belgium catalogue): had yellow shoes and no sunglasses. 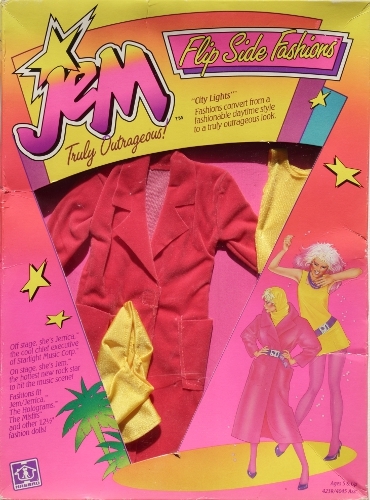 # The drawing of City Lights on the 1986 Flip Side Fashions box art is nearly spot on. Good job! # It did appear on the cartoon. # It is one of the outfits featured in the Rock Backstager commercial. It may be in other commercials I haven't yet screen captured for this site. Credits: Thanks to Rhonda Robinson for the photo of the sunglasses variant. Thanks to Glamour to Divaz for letting me photograph everything else except for the necklace, shoes and sunglasses. 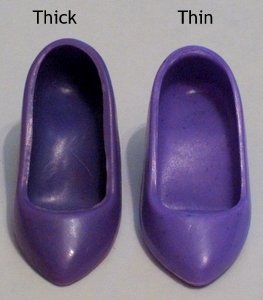 Thanks to Liz for the photo of the thin vs thick sided shoe picture. Thanks to Janet for the H44 box information.